Yes brother, its that time of year again. Time for our annual ARCHON GOLF CLASSIC. This traditional event has been held every year for 18 years. Along with May Day, this fraternal occasion provides a powerhouse of opportunity for all of our brothers to gather for some social fun, good food and support for a good cause…to raise funds for our new scholarship, the Archon Family Scholarship. At the present time we have over $60,000 in the Active Fraternity Scholarship that is adminstered by the University. Of that amount ($60.000), $5,769 is available to award to recipicants from the Archon Active Order this year. We have the ability to grant a scholarship of $1000.00 per semester to successful active applicants who meet the established criteria. We greatfully thank our brothers who have actively supported this program. Now let me tell you about our new Archon Family Scholarship. This began four years ago after much consideration by the executive board over concerns raised from brothers during our general and annual May Day meetings. Those conserns had to do with our ability to direct those funds, and the thought that there was enough money in the actives scholarship to perpetuate itself, and that our purpose should be expanded toward a wider Archon interest that we directly controled. With 450 alumni members in our association, it was felt that our brothers should be given the opportunity and encouragement to send their own family to the University of Rio Grande. From this point on, all the money raised through the Archon Golf Classic will be directed to the Archon Family Scholarship and administered by a standing committee formed by the Exective Committee of your association. The current committee chair is Brother Rusty Bookman 78’. You can review all the details and forms for the Family Scholarship on our website www.archonalumni.org. This year we awarded our first Family Scholarship to the grandson of Brother Bill Holt 70’, Rio freshman Zane Robertson. We have created a new account to fund this new scholarship. 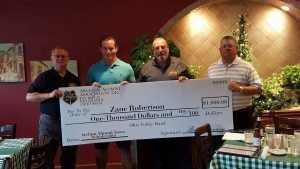 We now have $9,046.35 contributed to this account through the Golf Classic and other fund raising events like raffles, preparing and serving lunches at AEP Gavin, as well as private donations. We are so fortunate to have such “Strong Bonds” and we thank you for your continued support of the Archon Golf Classic. We hope that most of you can participate in our Classic or perhaps become a sponsor to our event. Please see our flyer or go to our web site for details and forms for your rsvp or donation.